The Battle of Prestonpans Tapestry visits Corby to ignite enthusiasm for the Diaspora Tapestry! As promised, the Battle of Prestonpans Tapestry outstripped Bonnie Prince Charlie in 1745 by pressing as far south as Corby this week, where it was eagerly hosted by the Grampian Club. It was no easy operation - with setup beginning at 7am on a Sunday morning - but the warm reception of the visitors soon made up for the early start! 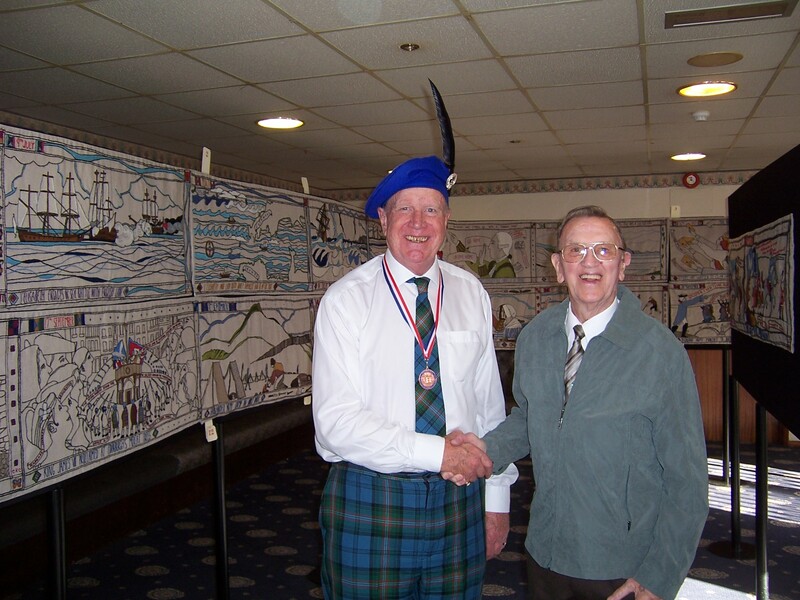 Pictured here are our own Gordon Prestoungrange with Corby's personification of its Scottish links, John Douglas. 6: Corby Crater on Mars, ASDA’s Largest Haggis, deep fried mince pies, Scots porridge eating, and more! Research is continuing, especially for those all important images which will inspire the artist, and Peter Hill and Billy Dalziel must be thanked for their continuing assistance.